Background: Stem cell therapy was established as a promising approach for regenerative medicine applications such as cardiac repair. However, current stem cell-based therapeutic strategies have serious challenges such as low retention and viability of transplanted stem cells in the injured myocardium. This significantly limits efficiency of stem cell therapy. In addition, poor knowledge about the fate and survival of stem cells after transplantation represents a major reason of conflicting results from recent clinical studies. 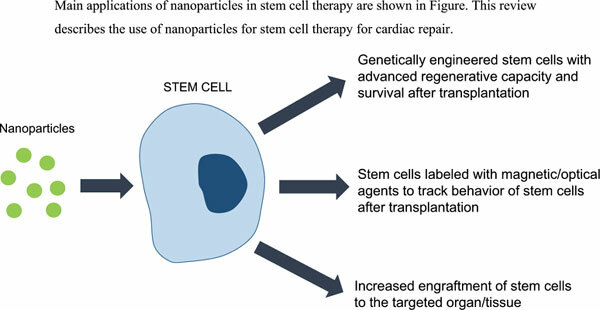 Objective: The purpose of review is to highlight key properties and possible applications of nanoparticles for therapeutic approaches utilizing stem cells for cardiac repair. Results: Nanoparticles that are widely used in various biomedical applications may serve as a valuable tool for overcoming these obstacles. Various types of nanoparticles could be efficiently used for delivery of genes that enhance survival and regenerative capacity and decrease apoptosis of transplanted stem cells in the adverse ischemic microenvironment. Furthermore, modification of nanoparticles with chemical agents and/or specific proteins and peptides greatly increases the possibility of targeted transfer of a cargo. Nanoparticles can also greatly facilitate in vivo monitoring of stem cell tracking. Using multimodality hybrid nanosized agents, it is possible to obtain detailed characterization of the post-transplantation behavior of stem cell engrafts. Conclusion: Using of nanocarriers may be very helpful to trigger the efficiency of cardiovascular stem cell biology. It is important however to keep in the mind safety and compatibility of implementation of nanoparticles to proceed to clinical trials. Nanoparticle, stem cell therapy, stem cell tracking, gene enhancement, cardiac repair, putative application.